With excellent DxOMark scores, 28 on a D3x (20th on the global DxOMark ranking) and 20 on a D7000 it achieves the 3rd position on the APS-C global DxOMark ranking. Resolution achieves 59 lp/mm on a Nikon D3x, 50 lp/mm on a Nikon D7000. This lens does not present outstanding defects to note, the distortion is very low and vignetting is well controlled even at 1.4. These two very good lenses present exactly the same behavior on the whole aperture range. The Canon and Nikon mount present the same resolution measurements in the field, same vignetting and chromatic aberration. Sigma 85mm F1.4 EX DG HSM Nikon mounted on a Nikon D300 vs Sigma 85mm F1.4 EX DG HSM Canon, mounted on a Canon EOS 50D (please, remember to change the camera body on the drop-down menu). 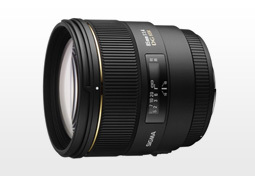 Sigma 85mm F1.4 EX DG HSM Nikon (mounted on a Nikon D700) vs Nikon AF Nikkor 85mm f1.4D IF (Nikon D700) (please, remember to change the camera body on the drop-down menu). Sigma 85mm F1.4 EX DG HSM Nikon (mounted on a Nikon D3x) vs Canon EF 85mm f/1.8 USM (mounted on a Canon EOS 5D Mark II) (please, remember to change the camera body on the drop-down menu).